422 pages | 192 B/W Illus. 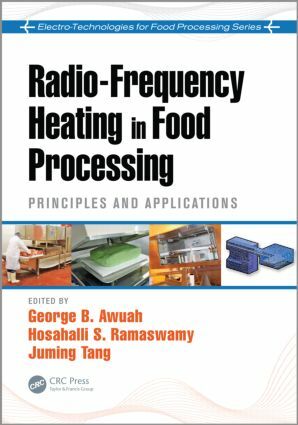 Radio-Frequency Heating in Food Processing: Principles and Applications supplies an in-depth overview of the fundamental science and engineering principles governing RF applications, as well as a solid understanding of industrial RF unit design options, challenges, and opportunities for development. George B. Awuah is currently the thermal process manager and process authority for Mars Petcare US, Franklin, Tennessee. He holds a B.Sc (Hon) from the Kwame Nkrumah University of Science and Technology, Ghana, and a Ph.D from McGill University, Montreal, Quebec, Canada. He previously taught at the Kwame Nkrumah University of Science and Technology; was a scientist and senior scientist at the Grocery Manufacturers Association, Washington, District of Columbia, USA; served as a research associate at McGill University; and collaborated with Agriculture and Agri-Food Canada, Guelph, Ontario. Widely published, Dr. Awuah is a member of the Institute for Thermal Processing Specialists and Institute of Food Technologists. Hosahalli S. Ramaswamy holds a BS from Bangalore University, India; an MS from the Central Food Technological Research Institute, Mysore, India; and an MS and Ph.D from the University of British Columbia, Vancouver, Canada. He is professor of food processing at McGill University, Ste-Anne-de-Bellevue, Quebec, Canada. During his 25 years at McGill, he has established several research programs in postharvest technology and food processing. Widely published and highly decorated, Dr. Ramaswamy is a popular keynote speaker, the editor of the Journal of Food Engineering, and a member of numerous boards and professional societies and a recipient of several awards, the recent ones being the Marvin Tung Award (IFTPS), fellow of CIFST, and fellow IUFoST. Recently, he led the Canadian team to win the bid to bring the 2015 International Congress of Food Engineering to Canada. Juming Tang is Regents professor and distinguished chair of food engineering at Washington State University, Pullman, USA. He has more than 20 years of research experience in areas of thermal processing using microwave and radio-frequency energy for food safety and pest control applications, in close collaboration with equipment and processing companies, related regulatory agencies, and US government research institutions. His laboratory developed 915 MHz single-mode microwave assisted sterilization (MATS) and pasteurization (MAP) technologies for packaged foods. Widely published and highly decorated, Dr. Tang is a fellow of the International Microwave Power Institute, American Society of Agricultural and Biological Engineers, and Institute of Food Technologists.